It is not the task of Christianity to provide easy answers to every question, but to make us progressively aware of a mystery. God is not so much the object of our knowledge as the cause of our wonder. Kallistos Ware, English bishop of the Eastern Orthodox Church, Titular Bishopric of Diokleia. Consider the child’s wonder at a rainbow after a storm, colors hanging in the air in a perfect arch, even sometimes doubled. We know the physics: white light split by the prisms of water drops into a predictable and familiar spectrum, seen only from particular angles. The facts of science and the narrow focus of reason so easily destroys wonder. Neither the drops nor the sun can see the rainbow; it isn’t even an abstract construct, the rainbow just doesn’t exist for either the light or the rain. If a tree falls in the forest, and no one is there to hear it fall, does it make a sound? Perhaps. Surely the whole forest, the soil and rocks, the smaller plants in the understory, and the surrounding trees feel the vibration – but when does vibration become sound? So the rainbow: if rain prisms white light into the colors of the rainbow and no one sees it, is there a rainbow? The objective theoretical explanation detaches the concept from the experience; the experience is percept. Both the tree crash and the rainbow require a sentient subjectivity that mere physics lacks – in short, eyes and ears (and their attendant nervous systems) make perception. Meaning requires a subjective being able to observe disparate phenomena such as these interact in the world. The colors of the rainbow and the crash of a falling tree both need witness. This split experience of the rainbow into subjective and objective is not either / or, one or the other, but rather both / and. The rainbow is exactly what it is – ambiguous and paradoxical. The rainbow’s meaning changes for us in the way our perceptions are framed, whether by unconscious bias or learned deliberation. This experience of learning to perceive situations in multiple ways is a constant throughout all of Marshall McLuhan’s work, a phenomenon he described as percept. In the present era we defer to the objective scientific explanation and dismiss the subjective, the percept, as mere illusion. Yet regardless of our present bias, the objective and subjective elements are both present. Our experience in the moment depends on figures shifting in a dynamic ground. This phenomenon is itself a simple analogy for the media ‘theories’ of McLuhan. How do communication media influence this process? Humans are wired genetically to communicate from birth. The human infant rushes to make sense of the world (input), and to influence the world, mostly his mother at first, with cries which turn to speaking (output). After speech, we mostly describe and think about our experience in words. But before words (and unconsciously after…), we are shaped in a cultural pattern influenced in great part by the communication media used by our family and community. Consciously or not, these pre-verbal patterns particular to each language, medium, and culture shape perception continuously. Many critics have accused McLuhan of being a technological determinist, citing his descriptions of media effects through history and in The Gutenberg Galaxy and Understanding Media as inevitable. By some, he is even regarded as a technological enthusiast. These are both great simplifications by those who neglect the emphasis McLuhan always placed on the arts as tools for training perception. The arts can form a contemporary counter-environment from which a witness might see the familiar and invisible habits of the present with a newly independent detachment. From that kind of insight, the witness might discover ways to change automatic or unconscious habit, and take the first steps toward an existential freedom. Percept consists of always shifting figures in a complex ground of formal cause, in individual lives and cultures alike. The ground of experience is not static, and the figures of perception not isolated concepts or definitions. McLuhan’s media ‘theory’ is not deterministic unless mankind remains passive, uncritical, and robotic toward media and culture. The potential for freedom, to be fully awake and aware, remains with conscious, critical awareness of the many frames (grounds) of media and culture bearing on perception. McLuhan’s breakthrough into popular media study was The Gutenberg Galaxy, a study of the cultural effect of the alphabet and then print on art, culture, and economics. In it, he argued that the alphabet created abstraction; meaningless symbols of name and sound were detached from the thing named, replacing the integrated whole of the spoken word with spelling. This shift from ear to eye was slow to spread throughout the fragments of Classical culture after the fall of Rome because before the printing press books were few, and readers fewer. Gutenberg’s mechanical reproduction soon changed that in many ways. The number of books increased and popular literature with readers emerged. The tactile handwritten letter became crisp, identical, and rapidly reproducible. McLuhan asserted that the experience of living with print and its culture shaped the sensibility of the user toward a bias for abstraction and sequence. The letters of the Western alphabet must be sounded, left to right, in an unnatural discipline, and every act of reading beats as percept on the pre-linguistic consciousness. This recurrent and largely unconscious experience underscores every act of reading, and creates a bias toward what Aristotle called efficient cause, the simplest form of causality based in simple cause and effect sequence. McLuhan argued this experience of alphabetic reading created an innate bias for abstraction and lead to scholasticism, the fracturing of the Trivium, and the isolation of dialectic as logic from grammar and rhetoric. This new dialectic built on abstraction and sequential logic (efficient cause) is the root of the scientific method. from the title page of An Essay In Aid of a Grammar of Assent, John Henry Cardinal Newman, 1858. Returning to the rainbow: this seemingly insignificant paradox of the rainbow is analogous to the latest split in the Church, which has already been playing out for nearly a century under the influence of burgeoning electronic culture. Christendom began as a mostly oral phenomenon, supported by rare manuscripts. The great Schism between Rome and Byzantium was rooted in the fundamental contrast of Latin’s visual bias to Greek’s softer oral bias, eye vs. ear, and how each relates to the Word and sacraments. The alphabet took centuries to create a dominating visual bias. The Greeks remained closer to their transition from oral roots, while the Romans became progressively more visual under the influence of the increasingly hard-edged Roman alphabet. After the Great Schism, literacy continued to spread slowly with manuscript culture, and Christendom appeared stable through the so-called Dark Ages, the era labelled in hindsight by Enlightenment historians because those intervening centuries lacked Progress, the rapid development of science and capitalism. (I hope that one day our own scientifically-biased age might be seen as another dark age as McLuhan, de Lubac, and Ellul among others have already described.) With the advent of print after Gutenberg, literacy began to spread rapidly with readily reproduced Bibles, bringing private interpretation and the Reformation to the Church, a second great schism. This was culturally a very momentous event; but to focus on the usual details of the political and religious history misses another media effect through the many centuries since. Literacy reigned supreme as the principal percept of the Western Church for several centuries, and lead to an exaggerated emphasis on dialectic, concept and definition (separating one thing from another), and logical consistency. Henri De Lubac was a well-known and once controversial Jesuit theologian who found himself on the outs with the Church for reasons that have been hard for the lay faithful to understand. Among other suspect acts, he explored Buddhism and actively defended his fellow Jesuit Teilhard de Chardin, a paleontologist who applied the the principles of evolution to eschatology. But the stone de Lubac threw into the placid, self-righteous Catholic pond which created so many ripples, was his suggestion in Surnaturel (1946) that the principal interpreters of St. Thomas Aquinas from the Renaissance, Cajetan, Suarez, and other neo-Thomists, had misrepresented the thought of St. Thomas Aquinas (Grumett, p. 10, 13) For de Lubac, this thesis brought isolation and suspicion for almost two decades. De Lubac does not write about media, orality, or literacy. 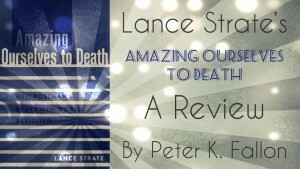 Rather, his approach is rooted in the changing use and experience of the classical trivium Grammar, Rhetoric, and Dialectic, as evidenced in the Church Fathers. Anyone familiar with McLuhan’s history of the Trivium and his subsequent descriptions of the effects of literacy (as well as the work of Walter Ong) will appreciate the shift in sensibility de Lubac describes. Specifically, de Lubac argued in Surnaturel that St Thomas did not believe in the strict separation of Nature and Grace that the neo-Thomists in their drive for logical consistency had made the standard of the Church. The unconscious percepts of print allowed this scholastic misconception built on the pre-dominance of reason and dialectic to run away with the Church for four hundred years. The world of consistency is the world of justice, but justice is not the final word. There is, above the consistent and logical world of justice, an inconsistent and logical world where nothing “hangs together”, where justice no longer damns each man to his own darkness. This inconsistent world is the realm of mercy. The world can only be consistent without God. . . . Such a world is not to be taken seriously, such a god is not to be taken seriously. If such god is “absent”, then doubtless the absence is a blessing. This strict division of Nature and Grace may seem like an arcane distinction to the lay person with his or her rosary kneeling before the tabernacle in adoration of the Host; fortunately such thought does not often reach the devotions of the lay believer. However, de Lubac recognized that the formal separation of nature and grace carried broad cultural implications beyond theology. On the one hand, though the dualist – or perhaps better, separatist – thesis has finished its course, it may be only just beginning to bear its bitterest fruit. As fast as professional theology moves away from it, it becomes so much more widespread in the sphere of practical action. While wishing to protect the supernatural from any contamination, people had in fact exiled it altogether – both from intellectual and social life – leaving the field to be taken over by secularism. Today that secularism, following its course, is beginning to enter the minds even of Christians. They too seek to find a harmony with all things based upon an idea of nature which might be acceptable to an deist or an atheist: everything that comes from Christ, everything that should lead to him, is pushed so far into the background as to look like disappearing for good. The last word in Christian progress and the entry into adulthood would then appear to consist in a total secularization which would expel God not merely from the life of society, but from culture and even personal relationship. . . .if revelation is regarded simply as a system of truths about God and an explanation of how the universe came into existence, . . . what is the purpose of Christian life, what are its moral norms, what will be the rewards of the virtuous, and so on, then Christianity is . . . reduced to a worldview, . . . a religious philosophy and little more, sustained by a more or less elaborate cult, by a moral discipline, and a strict code of Law. “Experience” of the inner meaning of Christian revelation will necessarily be diminished and distorted in such a setting. What will such experience be? Not so much a living theological experience of the presence of God in the world and in mankind through the mystery of Christ, but rather a sense of security in one’s own correctness, a feeling of confidence that one has been saved . . .based . . .on the reflex awareness that one holds the correct view of the creation and purpose of the world and that one’s behavior is of a kind to be rewarded in the next life. Close readers familiar with McLuhan will recognize the biases of the left and right cerebral hemispheres in the contrast of detachment and rule with involvement and presence in the moment. Let us look at the much publicized conflict between Cardinal Burke and Pope Francis. This is easily characterized as law vs. mercy. But in truth, it is a figure / ground paradox very like the ambiguities described above. Law, especially canon law in Cardinal Burke’s mind, is clear: this and this are sins, and you cannot be a communing Catholic in a state of sin by definition and rule. Offenders are excluded, and judged. Cardinal Burke would reduce the church to a narrow in-group of the morally correct. Mercy is rooted in conformity to Law; non et sic. But that black and white contrast is an artificial percept rooted in the visual bias of print and scholasticism. There is no such hard line between law and mercy. Like the experience and explanation of a rainbow, law and mercy form a whole paradoxical ground profoundly affected by percept. Rule defines a discipline, a discipline requires practice, practice requires imperfection; imperfection requires forgiveness; and forgiveness rests on mercy. On the other side from Cardinal Burke stands Pope Francis, choosing to emphasize mercy and forgiveness over law and rule. St. Alphonsus de Liqouri told his missionaries among polygamous natives not to emphasize Catholic teachings of monogamy, lest they create despair among the converts. Neither St. Alphonsus nor Pope Francis changed any formal doctrine. They are proceeding with the idea that conversion is slow, while we live; and judgement is for God, after our bodily life has ended. Christians make much of evangelization, spreading the good news and converting others – there is a significant group who call themselves evangelicals, and they call their activity witnessing. They emphasize creed and quote scripture as their argument. But this is didactic content and efficient cause, the Shannon-Weaver model of conversion – I beat you with my message until you concede. Some feel this idea of witness may do as much damage as good. Witnessing is NOT testifying to others what you already believe; that is professing. Instead of the content of doctrine and scripture, let’s consider a broader, less direct, and formal cause for evangelization: the light on the hill in the darkness, the light witnessed all around the cultural landscape. The Christian evangelizes like that light on the hill. The witness who sees this Christian is shaped by what he sees. True Christians shine, stand out, because of who they are, how they act, what they do. They have integrity, confidence, generosity, and mercy toward all, a rainbow of virtues. They do not act so because they intend to convert anyone; they act so because that is what they are, or at least who they, as often as they can, strive to be. They shine in the darkness, and the world sees it. They may have no more awareness of who sees their light than the rain and light have of the rainbow. They may fail in their Christian aspiration most of the time. But when they succeed, and when the success is witnessed, often by folks they will never meet, their light shines, and inspires the witnesses, others who are searching, watching for a sign of . . . what? . . . hope? . . . love?. . . God’s action in the world? Like the rainbow, the farthest reaching effect of acts of faith, hope, and charity are in their being witnessed, often at a distance, like a light on a hill. For too many of us, immersed unconsciously, uncritically in media culture, we only witness what we look at on this screen or that, the so-called ‘news’. We think the news is the way to stay informed, and under protection of freedom of the press, we cede our witness to reporters and their employers, the media owners and their many advertisers. The employer wants eyes for advertisers, and tailors the content to attract the most users. This intent tends toward the sensational and lowest-common-denominator audience. The perceived urgency of staying up-to-date becomes a requirement for the uncritical audience, and this unrecognized dependent passivity becomes an effective tool for social control for the interrelated commercial powers. In short: propaganda. The resulting repetition of fears about crime, jobs, foreigners, terrorism, the constant chatter of the ‘news’ becomes all we witness, the content of all our thoughts, a litany of darkness, and no light in the cultural night.
. . . I would say these mysterious realities are to be sought where we least expect them, not in what is most remote and mysterious, but in what is most familiar, what is near at hand. . . what speaks or sings in our ear, and practically does our thinking for us.
. . . how does one stop to separate the truth from half-truth, the event from the pseudo-event, reality from the manufactured image? It is in this confusion of images and myths, superstitions and ideologies that the “powers of the air” govern out thinking — even about religion! Where there is no critical perspective, no detached observation, no time to ask pertinent questions, how can can one avoid being deluded and confused? Someone has to try and keep his head clear of static and preserve the inner solitude and silence that are essential for independent thought. Certainly events happen and they affect me as they do other people. It is important for me to know them, too; but I refrain from trying to know them in their fresh condition as “news”. When they reach me, they have become slightly stale. I eat the same tragedies as others, but in the form of tasteless crusts. The news reaches me in the long run through books and magazines, and no longer a stimulant. . . .
My own experience has been that the renunciation of this self-hypnosis, of this participation in the unquiet universal trance, is no sacrifice of reality at all. To “fall behind” in this sense is to get out of the big cloud of dust that everybody is kicking up, to breathe and see a little more clearly. When you get a clearer picture you can understand why so many want to stand in the dust cloud, where there is comfort in confusion. Evangelizing implies apostolic zeal. Evangelizing presupposes in the Church the “parresia” of coming out from itself. The Church is called to come out from itself and to go to the peripheries, not only geographical, but also existential: those of the mystery of sin, of suffering, of injustice, those of ignorance and of the absence of faith, those of thought, those of every form of misery. Soon-to-be Pope Francis in Olson. The light shines into the darkness, and in shining creates witnesses, if there are any able to see. 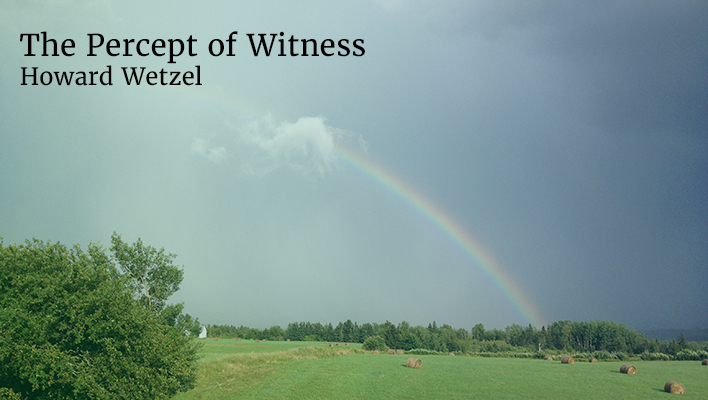 What does it mean to to be a witness? We passively witness much with little or no reflection. But when we look more actively, we witness more knowingly by being awake to another more encompassing picture than what the present media and culture present. Witnessing demands openness as a condition for seeing what needs to be seen behind and beyond the branding and propaganda. Seeing wholes, the subjective percept as well as the scientific fact, with wonder and paradox. In other words, appreciating both rainbows and faith as mysteries first. Not an easy task in this determinedly secular time, when we have given up so much to the comfort and trust of technology, at great cost to our bodies, communities, and sense of spirituality. The path to freedom demands critical understanding and control of the patterns we are immersed in, many of these patterns created by media. Retreat and silence can provide a distance from the overwhelming social and scientific opacity of linguistic cliches and media chatter, and encourage pre-verbal rewiring in an independent direction, a counter-environment to the ceaseless moment-to-moment din of the connected era. This retreat might mean the monastery if you are as radically inclined as Thomas Merton. But it may need no more to start than quitting Facebook or ditching the smart phone. Brain plasticity always ‘reaches toward’ or ‘imagines’ an accommodation for connection and influence with its environment through experience, through the patterns of percept. The sense of the verb “to imagine” contains the full richness of the verb “to see”. To imagine is to see most clearly, familiarly, understandingly with the eyes, but also to see inwardly with “the mind’s eye.” It is to see not passively, but with a force of vision and even with visionary force. To take it seriously we must give up at once any notion that imagination is disconnected from reality or truth or knowledge. Freedom then consists of assuming responsibility and control of as much of the experience shaping our brain as possible. Freedom then consists in understanding your environment and creating the means to stand apart from its deterministic effects by deliberately influencing the inputs constantly hammering on the brain. In short, brain plasticity can be a way to freedom. The brain’s accommodation to its environment is not imaginary; the use of the word imagination fills in what is not known about the changes of plasticity that reason and science alone do not explain. And you shall know the changes by their fruit. The child witnesses a rainbow, and the scientific explanation should not eclipse the wonder of its first sighting, his initial witness. The seven virtues are like that rainbow in many ways. Like the color spectrum, they are not really separable into discrete phenomenon; they shade into each other. Hope, charity, mercy, and love all tend toward faith. And like the rainbow, the experience of the virtues, not their rationale or definition or doctrine, is the greatest part of their meaning. Faith, hope, mercy, and love are precious social attributes, not sociological concepts. Their definition means little to those who have not experienced them, or worse, have experienced their opposite. These virtues are created in human kind as percepts, patterns, by being witnessed again and again and again. To see them around us we need to look actively past many imperfections, failures, and sins. We need to find a joy in being virtuous that is greater than our fear of being sinners. And so too for God. “Seek and you shall find; knock and it shall be opened.” If we only fear God, it is hard to find joy in knowing Him. Look, seek God as an eager awakened witness, and the experience of the search becomes Faith. If you attend well, you may see generosity, concern for strangers, hope, mercy, or the child’s wonder at a rainbow. All these are Grace, God looking for you, the witness who can see. Berry, Wendell. It All Turns on Affection: The Jefferson Lecture & Other Essays. Berkeley, CA: Counterpoint, 2012. Print. Grumett, David. De Lubac: A Guide for the Perplexed. London: T & T Clark, 2007. Print. Lubac, Henri De. Preface. The Mystery of the Supernatural. New York: Herder and Herder, 1967. Xi-Xii. Print. McLuhan, Marshall, Eric McLuhan, and Jacek Szklarek. The Medium and the Light: Reflections on Religion. Toronto: Stoddart, 1999. Print. Merton, Thomas. Raids on the Unspeakable. New York: New Directions, 1966. Print. Olson, Carl E. “Pope Francis and Henri De Lubac SJ.” Catholic World Report – Global Church News and Views. Joseph Fessio SJ, 28 Mar. 2013. Web. 14 Aug. 2016. <http://www.catholicworldreport.com/>. Spadaro, Antonio, SJ. “Introduction.” Introduction. A Big Heart Open to God: A Conversation with Pope Francis. New York, NY: HarperCollins, 2013. 3-6. Print. Howard Wetzel has been a hospital-based RN for more than three decades. He was introduced to the McLuhans in the early 70s, and has continued an active dialogue with Eric McLuhan since. He is an independent thinker with interests in health care, arts, theology, and media studies. He is interested in the impact of media on cultures and the Church in history and in the present.